That was a trick question from Selina! All of them are things you could be doing if you worked in the gas industry! Lots of people work in the gas industry - you may be surprised at how many different things they do. Find out a bit more about Debbie and Andy. At school my favorite subjects were maths, food technology and rugby. After I finished school, I went to university and did a degree in engineering - that's all about how things work. Now I work on all sorts of projects to keep our equipment working, or to make it work better. 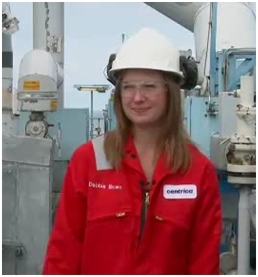 I've even spent time out on the rigs at sea, which was fun (even though it messed my hair up). I like repairing things, so when I left school I did an engineering apprenticeship and trained to be a “Marine Engineer”. I learned how to fix engines on ships and got to travel to lots of exciting places like Brazil, India, Singapore and Chile. 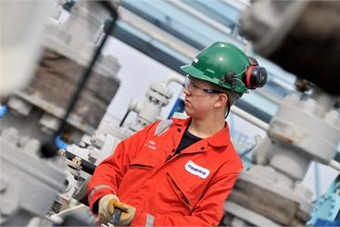 Now I work on a Gas Rig in the North Sea where I help to make sure that there is always enough gas flowing down the pipes to heat people’s homes and cook their dinners. I also get to travel to work by helicopter!